The Boeing 747 production line in Seattle becomes emptier day by day as orders for passenger variants of the B747-8 have dried up and the present backlog is mostly for the B747-8 freighter. United Parcel Service (UPS) ordered 14 B747-8Fs in 2016, of which three were delivered to the airline during 2017. The order placed in 2016 also stipulated an option for a further 14 aircraft of the same type. UPS surprised the market and Boeing last week by firming up the option for the aircraft, bringing the total to 28 B747-8Fs. This will ensure that the B747 production line stays open for some time to come with the hope that maybe other orders will follow. 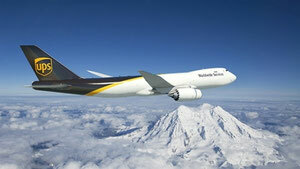 UPS also placed an order with Boeing for four B767Fs. These along with the remaining 25 B747-8Fs will all be delivered to UPS by 2022. Actual book value of the UPS order is said to be just over US$ 6.5 billion. 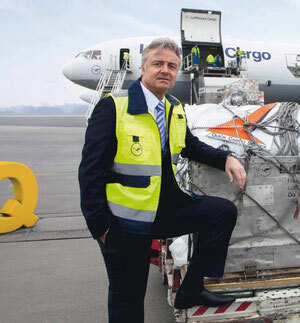 The Frankfurt based Quick Cargo Service (QCS), one of Germany’s top IATA agents has announced that they will expand their BUP consolidation units within the North and South American area. A series of new routes will be added to the portfolio already on offer to QCS clients. In North America, Chicago and Atlanta will come on line as well as Sao Paulo, Lima, Mexico City and Bogota in South America. Apart from the above, QCS also plans to greatly increase capacity offers on their present routes in the area. Eurowings, the low-cost Lufthansa owned passenger carrier whose long haul fleet is made up of Airbus A330 aircraft and which is presently still based in Cologne, has carried out their first commercial transport of an automobile in the belly of one of their A330 passenger aircraft. The car was a SEAT Arona model and was transported from Cologne to South Africa. Lufthansa Cargo along with its partner Aircargo Consulting are said to have developed a special process which includes the use of a ‘loading simulator,’ whereby cars can be carried in the bellies of the Eurowings fleet. Joachim Binte, Director Sales and Handling for LH Cargo in Cologne stated: “We have started with destinations in southern Africa and are planning to expand to other Eurowings destinations. As of next October, Eurowings will base their long-haul fleet in Dusseldorf, abandoning Cologne-Bonn Airport. The rhinos are carefully unloaded after their arrival in Rostov-on Don - courtesy V-D.
Two very valuable and rare Southern White Rhinos have been transported in a Volga-Dnepr IL-76TD-90 freighter from Tel Aviv, Israel to Russia and are now on show in one of the country’s largest zoos in Rostov-on-Don. White rhinos are now a specially protected species after facing complete extinction by illegal hunting over the past few decades. This has been the fate of their close relatives, the Northern White Rhino. CEVA Logistics, the supply chain management company which has operations across the globe, has opened a new multi-user warehouse in central Spain. It is situated in Alovera, which is an industrial centre 50 km northeast of Madrid. The new warehouse offers 16,000 sqm of handling space along with 400 sqm of office facilities. The new multi-user facility will house various customers after a new CEVA team has set up operations there. The Alovera facility is the latest of a number of CEVA multi-user centres in Spain. CEVA also announced last week that they have appointed Eddie Aston as new Managing Director for the UK, Ireland and Nordics. Mr Aston joins CEVA from Northgate, a commercial van hire and leasing organisation, where he also served as UK Managing Director. He will be based in the company UK cluster head office in Ashby-de-la-Zouch in the Midlands. Aston succeeds Michael O’Donoghue who has been promoted as head of CEVA’s North American cluster. Hong Kong-based Hong Kong Air Cargo Terminals Limited (Hactl) has added yet another new customer to their handling portfolio. YTO Cargo Airlines which is the airline operating arm of the Chinese courier company YTO Express, started operations from Wuxi to Hong Kong at the end of January utilising a B757-200F which can carry up to 30 tons of cargo. YTO will operate four flights per week on the route. Hactl offers YTO Cargo Airlines a so called one-stop-shop ramp and terminal handling service for their operation. Hong Kong is YTO’s first international destination and the company states that there are plans to add scheduled flights to Russia, South Korea, Japan, Macau and the Philippines in the future. Johannesburg, South Africa-based Safair which has a fleet of almost 20 aircraft has just taken delivery of a single B737-400 freighter which was converted from a passenger/freight combi version. The aircraft which is 25 years old was converted in Tampa, Florida and will join Safair’s single B737-400 Combi aircraft and its fleet of six Lockheed Hercules freighters. The carrier also operates twelve B737 passenger aircraft on scheduled regional routes in southern Africa for the FlySafair low-cost operation. We appreciate comments even if they appear somewhat pretentious and wiseacre.